When I saw the news yesterday that GM is closing five plants and laying off nearly 15,000 employees, I was surprised. Not because it was happening, but because this could be an extremely forward looking move by the company. Before I go on, I feel it’s important to present this article from a business perspective. In other words, what does this mean for GM as a company. The personal story of the people who are losing their jobs aren’t really a consideration in that case, even though obviously they should be. Having said that, GM like all companies, is in a fight to stay ahead in its industry. Companies don’t make decisions to lay off those people without thinking them through. Even beyond any potential feelings of empathy for the workers, layoffs usually spur poor publicity, and in the case of GM will also create a battle with the auto workers union, neither of which is something the company wants. Yet, the decision to cut positions ultimately is connected to a business strategy that management feels makes the most sense at that given point in time. Sometimes it works, and sometimes it doesn’t. It still negatively impacts those who lost their jobs. But that isn’t the focus of the rest of this article. With all of that having been said, let’s dig in here for the reasons that GM may have made this move and why now was the right time. The majority of the articles written about GM’s announcement talk about how GM sales have been dropping, and that’s the reason for the closures. And it’s true, sales dropped 11.1% in Q3 2018 compared to Q3 2017. But there are a few problems with that. The first is that Q3 2017 was affected by higher than normal sales due to the effects of Hurricane Harvey. So, sales dropped, but those drops were expected due to unique circumstances, were less of a drop than was anticipated, and GM still managed to improve its profitability. That’s not exactly the sort of results that cause businesses to lay off thousands and discontinue large segments of their market. It does, however, work as a good scapegoat to changing your business strategy to try to meet a new market. The media seems to have adopted recently that SUVs and crossovers are all that anyone wants now, and I hate it. I could have devoted an entire article to just this, but there are again factors at work here that I feel are driving the shift, so I’m going to try to encapsulate them here. First, automobiles are lasting longer than ever before. When gas prices rose significantly, the majority of automobiles that were sold were smaller vehicles, many of which are still on the road today and nearly as good as the newer models. As a simple, single data point, the car that I traded in for my Model 3 was a 2008 Nissan Sentra. The 2015 Nissan Sentra looks physically the exact same as my car did. Right along with this, a dealership makes the majority of its money on used car sales and service, incentivizing dealerships to sell consumers on these cheaper, new-looking sedans instead of directing them into the most recent 100% new model. On the flip side, if you want a crossover or SUV, there are far fewer old, used options. Remember that when gas prices rose quickly about 10 years ago, people were dumping their SUVs because they could no longer afford to fuel them. Sedans made up the majority of new sales, and the used market had a glut of SUVs that dealers couldn’t give away. Those used SUVs have aged out of the market — how often do you see Hummers driving around now, for instance — meaning if a driver wants to move into that vehicle segment, chances are she or he is going to be opting for a new vehicle or paying a lot for a used one. This gives automakers a few incentives to sell larger vehicles — not just can they charge more for them, but the technology to get them to be CAFE compliant is cheaper. These two factors I think often go overlooked in the SUV “boom,” and it may be less of a boom than a temporary realignment. The narrative of an SUV surge and changing car buyers tastes is a good excuse by car companies, however, to hold off costly development into new cars. This can’t be understated, yet it seems that the majority of investors haven’t grasped this. Electric vehicles are a material risk to legacy automakers. Here’s a weird yet true fact — GM “burned” more cash in Q1 2018 than Tesla did. GM reported an adjusted automotive free cash flow of negative $3.464 billion. Tesla, which pundits were lined up to declare as a cash burning machine after Q1 2018, reported free cash flow of negative $785 million. I’m highlighting this for a reason. Legacy automakers are having a difficult time creating a compelling electric vehicle that they make money on, and they have to spend significantly more money than Tesla does just to retain their position in the gas car business, a business which is expected to decline as electric vehicle sales increase. Instead, GM (and every legacy automaker) has been forced into a difficult corner. 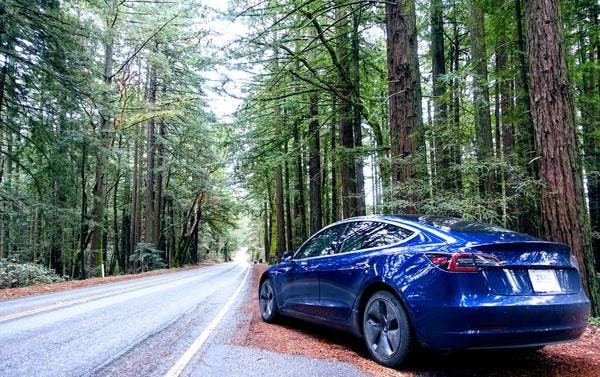 Developing proper EV tech is not as easy as dropping a battery and electric motor into a car and calling it a day, as Tesla has clearly shown us. In 2010, it was estimated that bringing a new car model to market costs an automaker around $1 billion to $6 billion. I can only assume a whole new architecture would be even more. Invest too much too soon, accidentally kill your gas car business, and you’ll burn so much money that the company will go bankrupt within a year or two. Invest too little, and if the market shifts to electric cars that you haven’t yet developed, your margins crash and you burn all your money trying to quickly catch up and create a compelling, high-volume EV. Is the Model 3 to Blame? This may sound crazy on the surface, but I don’t think we would have been here without the Model 3 doing what it has done. To keep their smaller cars CAFE compliant, GM has to spend more money to develop better technology, which leads to smaller margins on those cars. A smaller margin on these vehicles means even a minor drop in sales could lead to significant losses. What could have led to a drop in smaller sedan demand? According to AAA earlier this year, one in five drivers wants an electric car as their next vehicle. I don’t think it’s a coincidence that both Ford and GM have discontinued huge segments of their sedans in the past seven months. Both companies see mounting development costs for a product that could be rapidly replaced. Ford seems to have no real plan, but GM seems to be trying to meet the challenge head on. And, it’s going to get worse for legacy automakers soon. By 2020, Tesla will have the $35,000 Model 3 and could be spooling up production for the Model Y and truck. If a large number of buyers hear about these new electric models and decide to hold off purchasing a new gas car to see what is brought to market, that drop alone could be enough to put a legacy automaker that hasn’t created compelling electric options of their own into a tailspin. This is what makes yesterday’s news so interesting. Most reporters stated that GM is responding to falling sales by focusing on its larger and more popular models. Looking at the numbers, that isn’t what seemed to happen. GM is discontinuing the Chevy Cruze (31,971 Q3 sales), Impala (16,290), and Volt (5,429), the Buick LaCrosse (2,290), and the Cadillac XTS (4,101) and CT6 (2,281). Of these, both the Volt and XTS actually had increasing sales in Q3. The Cruze, even with a 27% decrease in sales, was still Chevy’s fifth best selling model, and it accounted for over 6% of all Chevys sold. We could contribute the decrease in Cruze sales to a lot of things, but if an automaker were to believe that the decrease in sales came partially from buyers holding off until they found a compelling electric car, this might be the time to ditch those models before they bleed too much money. This might be the time to quickly rush the new electric vehicles to market. When automakers suddenly find a luxury-priced sedan is all of a sudden competing on the best selling car list, it may be a wake-up call of sorts. There isn’t a compelling, reasonably affordable SUV or truck option. Yet. But with the Tesla Model Y and Tesla pickup truck coming — and new entries like the Rivian truck entering production — within just a few years, a modest decrease in demand (as consumers wait to see how the market shakes out) could destroy legacy automakers. I believe GM when it says that its new motto is “Zero Crashes, Zero Emissions, Zero Congestion.” There is a reason that Tesla’s market cap is significantly higher than GM’s even as GM delivered more than 8 times more vehicles than Tesla did in Q3. Not just is Tesla unencumbered with a legacy gas car business, but it promises a future that investors, the market, and consumers all expect to arrive. I believe that GM’s stock price is significantly hampered specifically because it has a legacy gas car and engine business that many investors aren’t sure can be easily wound down. In the past, I have argued companies say exactly what they mean, and then pundits tear it apart to figure out hidden meaning behind it that often isn’t there. Here is the actual press release from General Motors. It’s worth a read. In it, the company specifically points out that it expects to double electric and autonomous vehicle resources in the next two years, that it will prioritize future vehicle investments in its next-generation battery-electric architectures, and most interesting of all to me, that it is going to combine its vehicle and propulsion engineering teams. These statements, along with the market forces shaping sedans right now and the writing that is on the wall for companies that don’t develop compelling electric vehicles that can turn a profit, says to me that GM is going all in on electric tech.